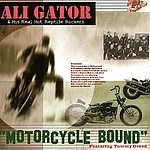 Here Ray Collins (leader of the HOT CLUBs and composer of hits such as Barefoot or Bye Bye Paris) publishes now under its Christian baptismal name "Ali Gator" Rockabilly noise like it since Hasil Adkins anybody did not dare to take up more. During it with Songs like "Real strange Feeling" with transverse flute employment and a bitter warning of marijuana still relatively intellectually happens, goes with Songs as "Wild" finally any civilization the brook down. Developed the photographs between 1993 and 2006. After the publication on a few EPs, which bought only absolute Freaks under shop bars, was to be packed it now highest time of this musical Demolution Derby on an album. Motorcycle Bound is the optimal sound track for each tavern fight with bad guys.